Main purpose of this report is to analysis Service Marketing of Private Commercial Bank, here focus on Mercantile Bank Limited, Rajshahi Branch. Other objectives are to measure the marketing activities and problem behind those activities. Report also find out service efficiency and find out latent demand of customer. Finally identify strength, weakness, threats and opportunity and observe future growth prospect based on Service Marketing. Service business, like other business, considers customers as kings and queens. Their competitive power in the industry, even their existence in the same depends on their acceptability to present and potential customers. Customers’ acceptability to any company is the outcome of the ability of that company to provide the customers with superior value. Customers’ value again depends on the level of perception of the service they have received. Whenever, after consumption of service, the perceive level of service customer receive, is perceive less than the expected level of service, the customers become this satisfy. When customers are this satisfy to the respective service providers they may either do nothing or may simply switch to any other service provider of that industry. Commercial Banks are the most important functionary of financial system of a country. They play a dynamic role in the economic development of a nation through mobilization of savings and allocation of credit to productive sectors. All the policies, programmers and strategies of a Bank must be formulated and implemented to satisfy the needs of the customers in the most efficient manner. Communicating effectively and if necessary instantly with customers at different levels on different matters. Being close to customers physically or otherwise. Processing customer order efficiently and instantly. Gaining confidence and trust of customers. Listening to customer complaints and taking action on them. Finding out new requirements of customers and endeavoring to fulfill these requirements. Mercantile Bank Limited is one of the reputed commercial private Bank of Bangladesh. There are 20 branches of Mercantile Bank Ltd. in Bangladesh and Rajshahi branch is one of the branches. It provides services to thousands of people of Rajshahi district with the activities of special investment as well as general banking, foreign exchange and loan & advance activities. It is necessary to find out the nature of the service facilities and the ways of improving customer services. Marketing is the performance of the business activities that direct the flow of goods and service from producer to customer or user in order to satisfy customer and accomplish the firm objectives. In order to achieve the customer’s satisfaction product must be available in the right from of the right firm in the right place and the number that will allow customer to obtain possession of the product. Bank is the symbol of financial stability of a country. It is an institute which is responsible for safeguarding the financial stability of a country. In modern age the role of Banks is very wide as well as comprehensive. Mercantile Bank Limited contributes over all the fields like agriculture, small and middle industry. It take part Trade and commerce, Foreign exchange and foreign trade, poverty alleviation etc. and much more. In last year it can bring a significant change in different internal policies as well as introduce some new financial products. The new financial products are: 1) Life long pension scheme. 2) Consumer credit scheme. 3) Small loan scheme 4) Lease financing 5) doctor’s credit scheme 6) Rural development scheme 7) Women Entrepreneur Development scheme 8) Special saving scheme for service holders etc. So it is very much important to find out the problem and prospects of customer services of Mercantile Bank Limited, Rajshahi Branch. After knowing customer opinion about service and Bank performance of Mercantile Bank Limited, Rajshahi Branch will be capable to achieve customer satisfaction. Which problem we have find out from the SWOT analysis the corporate branch will take initiation to solve these problems and gives guideline to Rajshahi branch to be more profitable to ensure how to solve problem. To find out various activities/services rendered by the Mercantile Bank Limited. To measure the marketing activities and problem behind those activities. To know the opinion of the customers regarding the existing services of the Mercantile Bank Limited. To find out service efficiency. To find out latent demand of customer. To identify strength, weakness, threats and opportunity and observe future growth prospect. To observe future growth prospect. H-1 :Ranking of factor that the choice of mercantile Bank Rajshahi by different bussiness man is different from the ranking of executive of MBL, Rajshahi Branch. H-ll :Ranking of Factor factors that the choice of bank by service holder is different from the ranking of executive of MBL, Rajshahi Branch. H-iii: Ranking of Factor factors that the choice of bank by other customer is different from the ranking of executive of MBL, Rajshahi Branch. A questionnaire containing scenarios served as the data collection method the maximum data was collected from respondents in the Bank and observation method has conducted to determine whether the customers are with the service rend end by the Bank. A set of question is essential for colleting primary data from individual sources through interviewing that is why I have to prepare a questionnaire carefully. I have use easy language to easily understand consumer. The size of questionnaire in respect of number minimum as per as possible. I have to avoid dual ward and leading question. Technical question is also avoided. Considering the above terms condition I have prepared some open ended and close ended questionnaire for the clients to fulfill my research objectives. Mercantile Bank limited, a private commercial bank with head office at 61 Dilkusha C/A Dhaka, Bangaldesh started operation on 2nd June, 1999. The Bank has 20 braches spread all over the country. The special objective of bank was to exploring a new horizontal of banking and provides a wide range of quality products and service comparable with those available with any modern bank in the world. Its authorized capital was TK. 800 million and a paid up capital of TK. 245 million contributed by sponsors. 100 percent private sponsors own the total share of capital. The numbers of sponsors are 30. 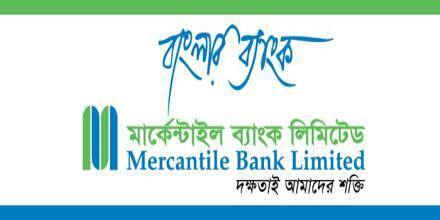 Rajshahi Branch is the 7th branch of Mercantile Bank Limited. It located in Shaheb Bazar zero point, Which is central position of Rajshahi. The formal commerce minister and chairman of the Bank Mr. Abdul Jalil inaugurated this branch on the 1st February of 2000. and the activities of the branch has started from the next day. This branch has established to consider the business man banking needs including L/C. Mercantile Bank Limited, Rajshahi Branch, Rajshahi has started it’s business from 1st February, 2000 as 7th branch of the Bank. Since inception of the branch, we had tried our best to expedite overall business in Rajshahi. From the very beginning of the branch, we have always looked forward for concur business with a diversified perspective. Meanwhile, our deposit increased up to TK. 5004.18 lac, advance up to 3565.97 lac, import up to 906.10 lac & profit up to 104.08 lac in the year 2006. Substantial number of clients of deposit & loan account has also increased. We had also achieved all types of business targets that given by our Head Office for the last three years. By opening of an account a person/s becomes a customer of a bank. It is a legal contract between the bank and the customer. An account opening from is the contractual document. It is the legal basis of banker – customer relationship. The rules and regulations for opening of an account vary from customer to customer. Now a days, it is very risky for people to carrying cash in hand and keeping money in the house so, these people can be safe by keeping their in the bank. Mercantile bank mobilize deposit through the following accounts. Any number of transactions in a day. Statement of account at any desired frequency. The saving account is primarily for small – scale savers the main objective of this account promotion of thrift. Hence there is restriction on with drawls in a month. Heavy withdrawals are permitted only against prior. Minimum amount of Tk. 500 is required as initial deposit. Frequent withdrawal not allowed. The role of interest is 6.5%. This kind of account is opened normally various big companies, organizations Government department etc. This account is operated like current account. If 7 days written notice is placed before the bank is gives interest at the rate 6.00% per minimum. Deposits are life blood of a commercial Bank. Since commercial bank deals with other people’s money, without deposits there is no business for the commercial Bank. Accepting deposits is one of the main functions of MBL. Fixed deposits are the deposits in which an amount of cash is deposited in Bank for a fixed period specified in advance. These deposits are time deposits. Normally the money on a fixed deposit is not repayable before the maturity date of a fixed period. At the time of opening the deposit account, the banker issues a receipt acknowledging the receipt of money on deposit account. It is popularly known as FDR. It is a best saving scheme for the small savers through savings of fixed amount of money every month. One can get a lucrative lump sum amount of money after five, eight or ten years. The installment size range is given below. Move than one account is opened by one man. Premium rate is given ten days in a month. Loan is given agent savings. It is highly yielding saving scheme money doubles in 6 years. TK. 1.00.000 becomes TK. 2.00.000 in 6 years. By depositing the amount of TK. 57,500 or any coefficient value of this amount can deposit to any personal name or institution name for five years and the depositor can get a fixed amount monthly until a certain time. To help industrialization by increasing investment. Five thousand and amount to TK. Multiply any digit by five thousand is depositing under this project for eleven years. One can get three times on maturity. A depositor may withdraw his/ her depositing money after one year in any time of then project time interval. More than one account is opened by one man. Every coefficient amount of 5 thousand taka is saved. Loan is given against savings. The benefits for Installments of Tk. 2,000, Tk. 3,000 Tk. 4,000 and Tk. 5,000 are Proportionate with Installment of Tk. 1,000. Installment is deposited in date of ten per month. Ajiban monthly amount of pension and ageist pension one time paid him or her nominee. In exchange of monthly pension contemporary specified amount can with drew after duration. Depositor can with draw total specified amount in any time at enjoying person. After data nominee can with draw contemporary specified amount pension. Account holder may transfer his account from one branch to another for this he / she must apply with proper reason to the manager of the branch where he/ she are maintaining the account. Manager requests to the account holder want to transfer his account holder wants to transfer his account. Besides, he / she also send original copy of ‘Account opening form, and “specimen signature card and photocopy” of application for transferring the account with the balance remained in the account. Customer desires to close the account. Death of customer or insanity of the customer. The bank finds that the account is inoperative for a long period. To close the account, the Cheque book is to be returned to branch. Bank takes the risk and ensures payment to the beneficiary by charging the customer commission. Mercantile bank branch gives their customers the opportunity to different kinds to billing and to remit fond from one place to another the instruments which are used to remittance and billing are, D. TT. SDR and pay order. Demand draft is a negotiable instrument issued by a particular branch of a bank containing an order to another branch of the same bank to pay a fixed sum of money to a certain person or order on demand. This instrument can be purchased by a customer from a particular bank’s branch for himself or for beneficiary and can be handed over to the purchase for delivery to the beneficiary bank issue drafts for a nominal commission. The commission depends upon the amount to be transmitted mercantile bank charges the commission on DD 0.1% and minimum charge is TK 25. Telegraphic transfers quicker than a transfer of amount by DD. TT is the most rapid and con veining but expensive method. Telephone, Telex, Fax is different made of TT. If an applicant wants to remit the amount urgently to the payee is another city or district he/ she may request the banker to send it by TT. The Branch generally recovers from the telex charge in addition to usual service charges. SDR is one kind of bill which use the government tender, From SDR Bank earns a big amount. Mercantile Bank Rajshahi branch give credit facility against on SDR. Payment order is a written document. This pay order can be enacted on that Branch from where it is insured. Several suppliers, organizations use this P.O. it is issued locally. Mercantile Bank, like other private sector banks, is sponsored by the private industries that are strongly motivated by profit motives. So being a private sartor Bank Mercantile Bank has sat its credit operation and management functions keeping in view the objectives of its sponsors. Despite these acts, it has the objectives of operating as a partner of development by extending credit facilities to the intending borrowers in the field of trade commerce and industry. Loan sanctioning does not depend on a particular credit committee, rather being empowered by the Board offices at different level, sanction loans and advances the sectors presided. Branch Marriages can sanction loans and advances against financial obligations like Bangladesh Sanchay Patra, FDR etc. Sanctioning power of Loans and advances varies sector to sector for the officials of Mercantile Bank. Branches receive loan application and then forwarded to the Head office in the cases chare head office approved is required. After scrutinizing and filling a prescribed from where emphasis is given on the following point. Particular to securities offered and their value. Existing friability position in case of old barrows. Consideration is given on business volume, security, goodwill. If it is a renewal case, last one year performance is obtained and strongly considered. For a new loan sanctioning, the applicant for borrowing should have and account with the bank for at least six month to be an eligible applicant. This six months cash flow in addition to the considerations given on renewal given case is strongly monitored for sanctioning new loan. Loan proposal for one crore end about requires lend ding risk analysis (LRA) as directed by Bangladesh Bank. But banks may go for LRA for loan proposals of any amount at their discretion. It the loan proposal is accepted i.e. loan is sanctioned then a sanction advice is forwarded to the borrowers though branch points are mentioned. Foreign trade financing is an internal part of banking business. With the globalization of economies internal trade has become quite competitive timely payment for exports, quicker delivery of goods is a therefore a prerequisite for the success of international trade operation. The MBL, Rajshahi brunch works as an ‘Authorized Dealer’ for the financing of foreign trade and dealing with foreign currency. This branch has a good reputation with the importers and exporters. In MBL, Rajshahi branch ‘Foreign Exchange Department’ is mainly active on import Function. This branch operates Export Function. But export business of this branch is not mentionable. Import of merchandise involves two things brings of goods physically into the country and remittance of foreign exchange towards the cost of merchandise and services. In case of import, the importers are asked by their exporters to open a letter of credit. So, that their payment against goods is ensured. Documentary credit has emerged as a vital system of trade payment. It is a key player of foreign trade. Letter of Credit is a payment guarantee to seller by the buyer’s Bank. It is a credit contract whereby the buyer’s bank of behalf of the buyer is committed to pay and agreed amount of money to the seller under some agreed conditions. If the conditions of the credit do not require for presentation of specified documents, it is called ‘Clean Credit’. On the other hand, if the presentation of specified document is obligatory, the credit is called a ‘Documentary Credit’. Documentary Credit is an assurance of payment by the Bank. It is an arrangement to make the payment to the seller provides documents are submitted. Buyer and seller enter into contracts for buying and selling of goods/ service and the buyer instructs his Bank to issue L/C in favor of the seller. Here the Bank assumes fiduciary function between the buyer and seller. An importer is required to fulfill some conditions/criteria to be eligible as an importer as per provisions of Import policy order and guidelines for foreign exchange transaction. An importer is required to submit the following documents along with L/C application to get a license to import goods through MBL Bank Limited. L/C Application duly signed by the importer. Marketing is a total system of business activities designed to Plan, Price, Promotion and distribution wants satisfying goods and services to present and potential customers. According to the official definition of the American Marketing Association Marketing is the performance of Business activities that direct the flow of goods and services from producer to customer or user. The concept of Bank Marketing has been defined by various Bank Marketers as that part of management activity that seeks to direct the flow of banking service profitability to selected customers. The adoption of the marketing concept will recognize that Bank Customers are changing in terms of their wants, needs, desires, expectations, and problems Bank must define these in explicit terms and then evaluate their offering in customer’s terms. That is satisfying customers’ needs at a profit to the Bank. We cam say that the four P’s are interrelated and must be blended into one integrated whole to satisfy some target markets needs and performances. So, marketing mix is a set of product, price, promotion and place which are interrelated. The products of Bank are essentially services. Any satisfaction the customer gets from the performance of the service rather than from the ownership of goods. Banks are in the Business of marketing cash security, cash accessibility, monetary transfers and time to enable customers wants to be satisfied to day without waiting until tomorrow when their own savings are higher. So, banking product means services, which are able to satisfy the present and potential customers. Mercantile Bank limited Rajshahi Branch offer the following services. Offering more existing service to existing customer or client, that is market penetration Mercantile Bank Limited Rajshahi Branch are offering more service to existing customers. Offering more existing service to new client that is market development Rajshahi Branch tries to attention new client. Development New services/ Products to existing customer what is service/ product development. MBL Rajshahi branch are following this strategy. Develop new service for new customers, that is, diversification. MBL Rajshahi Branch has more diversify products to new customer. Bank interest rate means Banking Price. Price is important since it represents the only element of marketing mix that creates revenue. The banking system does not in fact price all its services. Since some are offered free to customers. The most important prices in the banking system relate to interest rates. The government controls basic interest rates. The term promotion is used to refer to the use of persuasive information which in conjunction with other elements of marketing mix, relates to the target market. The Bank has to decide how information about the organization and its services will be disseminated. Four elements of the marketing communications mix are generally recognized. Advertising is non-personal communication directed at target audiences through various media in order to present and Promote Products, Services and ideas. Advertising in banking alerts a potential user that a service or product will help him to reach as objective. There are two major types of advertising: Institutional advertising and Brand advertising. The private limited Bank can use the both types of advertising to introduce their Bank image and new services. Mercantile Bank Ltd corporate branch published advertisement through electric media such TV. Website and press media such as news paper, magazine. MBL Rajshahi branch published advertisement by the media of organizational souvenir and other magazine and this branch display outdoor advertisement beside the street. Personal selling is another element of the Bank promotion mix. It is associated with the Bank manager and his staff. Personal selling is an oral presentation and conversation with one or more prospective customer/ client. MBL Rajshahi branch are following this promotional method to delivery their services. Publicity is a non-personal stimulation of demand for products services or business units that is transmitted through a mass media at no change. MBL some times use this media. Sales promotion is short-term ince4ntive to encourage purchase or sale of a product or service. Actually promotional activities are conducted by Bank’s head office. Some of the private Bank Limited in Bangladesh are using credit cards, Bank branch etc. to provide Bank service to customer. But MBL Rajshahi branch provide their service through Bank branch. Here, I present this data on March 31, 2004 MBL Rajshahi branch. Here, we can see that, more depositors are involved in Monthly Saving Scheme. But Advance deposit Scheme is Nell and rest of three are involving with small number of people. So, it needs to inform these customers about their various types of scheme. This branch has sold total no. of Account until the March 31, 2006. In banking sector the main risk is business risk. For this purpose the liquidity problem is the problem for a Bank. To face that type of problem Mercantile Bank Limited, Rajshahi branch reserve money of their total deposit as a liquidity reserve in Bangladesh Bank. Beside they borrow money from others Bank it its need to minimize their liquidity problem. To create proper working environment. To give remuneration the employee. To operate computerize banking system. To delivery quick customer service. Market information helps to take appropriate decision, reduce risks, maker stability of demand, showing the right direction to the business man etc. In this case the Mercantile Bank Ltd. analysis Government power and regulation, the growth rate of the previous year. Annual six prize-literature, economic, science, education, journalism and sports. Research operation operates from Bangla Academy for research on Bangla literature. Selected book purchase and distribution. Free interest loan for self employee. Contemporary donation for distressed Artiest literature treatment of difficult disease. Uprooted project for development of disregarded helpless orphan babies. By linking with the societal marketing concept of the corporate branch, the Rajshahi branch also obey some social responsibility for the people and society such as- to distribute warm cloths among the destitute and poor people in our society. 18% of the customers of this branch are doing not know the various types of the product/scheme of MBL. We collect the customer opinions regarding the MBL’s interest rate on deposit and saw that 64% of the customers express their opinion the interest rate is low. So those customers do not motive to saving in this Bank. So this interest rate is a great problem of this Bank to increase or spend the deposit scheme. On the other hand we also collect customer opinion through questionnaire method about the interest rate on credit scheme. The customers also express the dissatisfactory interests on the credit the credit. They say that the interest rate against the credit scheme is high so they do not fell interest to take loan from the MBL. The percentage of those customers opinion is 71%. The people of Rajshahi region all are not well known about the MBL’s credit or loan scheme. For this reason this branch does not sale all types of credit scheme which provide the corporate branch. It is one kind of major problem of this branch to earn more profit. Quality of goods can not be ensured. Lengthy time for bulky import. Whether goods have been entered into country can not be ensured. CRF agent is importer’s commission agent; goods are delivered to importer without having Bank’s endorsed shipping documents. Delay in receiving Bill of Entry. There are some loyal customers in Rajshahi region. Those customers prefer modern on line banking service with credit card. So, those customers sought this type of on-line banking system is the Rajshahi region. But the Mercantile Bank Ltd. Rajshahi branch not able to include on-line banking system in Rajshahi branch for those type customer. So, it is a great problem to adopt the banking activity of Rajshahi branch with the present loyal customers need and expectation because those customer do not want to lost more time and effort to get banking service they are agree to give high banking charge if the bank can ensure them on line banking service in short time in right place. I have discussed about the advertising strategy of Mercantile Bank Ltd. Rajshahi branch with some selective respondent those respondent told me the advertising strategy of Mercantile Bank Limited, Rajshahi branch is not extensive to create public image about the providing banking service of Rajshahi branch. SWOT analysis the most important element to analysis the overall situation of any organization, strength, weakness opportunity and threat are the including elements of SWOT. It is possible to balancing the strength and weakness of internal environment with the opportunity and threat of external environment. In is easy to achieve the goals to face any situation through analyzing those element carefully. I have included SWOT analysis in my study for this reason. I think that corporate body can be able to through this SWOT analysis and they can take necessary step to over come any challenges. Here, the overall evaluation of a bank’s strength, weakness, opportunity and threat is called “SWOT” analysis. In general, a business unit has key external macro environment forces (demographic / economic, technological, political / legal, and social / cultural) and internal micro environment actors (customer, competitors, channels) that affect its ability to earn profits. SWOT is internal and external factor of a bank. Internal factors are controllable but external factors are uncontrollable. Internal factors are management related that is controlled by the bank. The impact of SWOT may negative or positive on the bank. Favorable impact of SWOT can create organizational growth and unfavorable SWOT creates organizational problem. A strength is a resource skill or other advantage relative to competitors and the needs of market a firm serves or anticipates saving. Strength is a distinctive competence that gives the firm a comparative advantage in the market place. The image/ Goodwill of this branch are very good. The market share of this branch is satisfactory than others private in Rajshahi. The product portfolio or scheme of this branch is exception than other private Bank of this district such as, National Bank, Jumuna Bank, AB Bank, Dhaka Bank. The branch has good communication with their client. For this the client of this branch is too much loyal upon this branch. The client is favorable regarding Foreign Exchange Service of this branch. The branch has huge amount of deposit and market potentiality. This branch has skilled and experienced personnel whom are properly handle clients need in right time and right place. The branch is providing various consumer credit scheme, commercial net work, standard documents keeping, computerized services, money transfer system, and international connection. Skill communication with other branch and corporate head office to solve any king of client oriented problem. The working place of this branch is too much upgraded so the employee feels interest to work here and have enough security for the personnel and client. A weakness is a limitation or deficiency in resources, skills and capabilities that seriously impedes effective performance. Corporate head office provide various types of product or scheme but Rajshahi branch cannot provide all those scheme to the client still now such as Agrim Sanchaya Prakalpo, Single Counter Service Prokalpo. The credit section of head office sanction various types of credit but Rajshahi branch cannot able to provide all those credit scheme to the client such as- Packing Credit, House Building Loan, Lease Finance, Hire Purchase, Doctors Credit Scheme, Rural Development Project and others. This branch does not operate extensive promotional activities among upper to lower level people regarding the various scheme and credit section and customer service. All kinds of decision taken by the top management so in many times this branch cannot able quick service. This branch has no online banking facilities for the clients which facilities are available in other branch. A marketing opportunity is an attractive area of relevant marketing action in which a particular organization or company is likely is enjoy a differential advantage. It is an area of customer need in which a company can perform profitably. Rajshahi is very old town. It is a big region in North Bengal. There is a lot of cultivating land here. Peoples of Rajshahi cultivate different kinds of agricultural product for this reason various types of agro based industry set up in Rajshahi. To set up those types of industry huge capital is needed those people try to collect their capital Bank loan. So there is a great opportunity for banking section to provide credit facilities and other banking service to fulfill the need of businessman and other professional people. The most important land port named Sona Masjid situated beside Rajshahi. The most import products of Rajshahi enter through these land ports. So, the importers of this reason want to open their L/C for operating their import business in a nearest Bank. Rajshahi branch is very nearest position for those people. For these reason it is a great opportunity for Rajshahi branch to capture those importer by providing our unique banking service business occurs here, the people withdraw and deposit foreign currency in this branch. Mercantile Bank, Rajshahi branch is situated at the central point of Rajshahi. So it is very easy to communicate with this Bank for all kinds of people and people can easily and safely to come here. Many types of middle class people live in Rajshahi. Mercantile Bank Ltd. provides various types of products/schemes and credit facilities to fulfill banking need of those people. So, it is great opportunity for this branch to collect deposit from the savory and the bank give credit facilities to the loan seeker from those deposit funds. In the modern time the all business activities are operating by modern technology. To collect the modern technology the business man has to invest large capital to get modern service in business field. If the businessman gets those modern technological services they have to take setter under the shadow of Bank to fulfill their capital requirement and transfer money. So, it is a great opportunity to the branch to sell credit card to set up on line banking service. Computer / internet based service to provide up graded banking service. An environmental threat is a challenge posed by an unfavorable trend of specific disturbance in the environment that would head in the absence of purposeful action, to the stagnation or demise of an organization or company, product. There are three well known national Bank such as Sonali Bank, Agrani Bank, Jamuna Bank the people are too much familiar with those Bank since a long time as those Bank establish early time than Mercantile Bank. Than reason the public image is more upon those Banks than Mercantile Bank. So, it is threat for MBL to create an extra image among those people. At present the main competitors of MBL are National Bank, AB Bank, Islami Bank, UCBL and other equal Bank. Recent, a new private Bank named Jamuna Bank Ltd. is operating their activities and through a challenge upon Mercantile Bank Ltd. Recent time Finance planning ministry have impose some rules and regulation such as- low interest on credit scheme money laundering act which are creating pressure for the M.B. to expand their scheme and other facilities. Shaheb Bazar is the most important trade point of Rajshahi district because it is the main point of Rajshahi city. people usually do not want to go in a far place to operating their banking service. To consider the demand of those people jamuna Bank Ltd. had opened a Branch to give proper banking service those people forms the nearest position. For this reason the people to this branch to save their time, security and travel expense. So, it is a great threat for Mercantile Bank to expand their market share in Rajshahi. The Mercantile Bank Limited, Rajshahi branch mobilized total deposit 37083.21 Lac as of March 31, 2004.This branch’s deposits are increasing day by day. So this branch are proving various loan and advance successfully in the year of 2004, 2005 & 2006, the deposit was 4106.30, 5286.90, 6002.60 Lac respectably. Banks are the principle source of credit for the borrower. One of the core functions of commercial banks is to create loan able funds for house holds (individuals and families) for local units of govt. for agricultural, commercial and industrial activities of a nation. This Bank distributes its funds among various sectors to drive sufficient in come. The MBL Rajshahi branch has not only earned good reputation in market but also performed well in term of financial performance. The lending is spread of out indifferent sector of trade, commerce and business including import and export finance. The small and middle class businessman can take large amount of loan for their special purpose from this branch. The total loans and advances of the Bank stood at Tk. 2145.98 Lac as of March 31, 2004. Because of the Bank image, from the very beginning this branch embarked extensive foreign exchange business with a view to facilities international trade transaction of the country. Most of the exporter and importer in Rajshahi region are conducted with this branch. This branch are providing export and import facilities to the exporter and importer such as export and import letter of credit, foreign remittances etc. The import performance of this branch is 16386.15 Lac in 2003. Mercantile Bank, Rajshahi branch’s target market small and middle class businessman. This branch already penetrated in this market and this market is expanding now amount and satisfactory customers in this branch who are regularly transacted with the branch. In the present time the branch has about 8000 depositor about 600 creditors and mentionable foreign correspondents. The total income of this branch was Tk. 170.60 Lac during the year 2001. But efficiency of service operation day by day branch income increase in 2003 the total income of this branch was Tk. 488.28 Lac. To observe the statistical analysis based data we see in every year the growth increase highly than the immediate previous year. The sequence of this growth rate gives a good symbol to the Mercantile Bank Limited a tremendous growth in future terms of increase trend of deposit, success in credit and advance successful foreign transaction, tremendously increases of customer, increasing total income. At present customer satisfaction is one of the important factor for continuing the business successfully that’s why Bank authority should observe/ monitor closely and continuously customer reaction about services. Advertising and promotional policy is very important for informing customers about the various new and attractive financial services. So, advertising program should be stronger for quick improvement of the Bank. The Bank can send message to target audiences by using advertising tools. The people who are interested to take a lion amount of loan from the Mercantile Bank of Rajshahi branch, they want to get special interest facilities for their credit scheme. So, the corporate branch should initiate to implementation interest rate of package program for the big loaned merchandise. The clients of Rajshahi branch to get on line banking service from the Rajshahi branch for operating their transaction and other banking activities with other branch in a short time. But dis expectation of those clients not comes into for the lack of online banking service in Rajshahi branch. So, the corporate branch should take a step to implementation online banking service, credit card facilities and ATM card (Automated Teller Machine) service, which will reduce time, cost and increase efficiency. Bank should take proper step in proper time for adjusting the competitive situation. The branch manager officers and executives who have achieved target in all respect may be rewarded. Bank should arrange a round discussion among the clients and bank management. This report has attempted to explain the banking services and policy allowed by the Mercantile Bank Limited and also attempted to harmonize and link the theoretical knowledge acquired in the previous term of MBA program with the experience gathered the period practical orientation. Comparing practical knowledge with theoretical involves identification of weakness in the branch activities and making recommendation for solving the weakness identified. Since all department and sections are covered in internship program, it is not possible to go to the depth of each activities of branch because of time limitation. So objectives of the internship program has not been fulfilled with complete satisfaction however, highest effort has been given to achieve the objectives the internship program. UBL is playing an important in the banking system and in the payment system of Bangladesh. The Bank has taken suitable policy and strategies on the basis of present situations. Finally it can be conclude that authority needs to think more about customer services and level of customer awareness- how to improve the service strategies, how to bring more speed in banking process, how to achieve more efficiency and above all how to obtain more deposit with lower cost . Otherwise it will be very difficult for the Bank to compete with the other international and native Banks that already have achieved such level of efficiency. Also every Bank has to be very careful about the credit/ advance banking. Overall awareness of both borrowers and the lenders has to be developed.